Each facial begins with a consultation of your skin’s special needs, followed by cleansing, toning, exfoliation, steam, extractions, massage, mask and re-hydration. Our experienced and knowledgeable aestheticians will be happy to make recommendations on the appropriate facial skincare products best suited for you. For noticeable improvements and lasting results, we encourage regular and professional home care products. A deep pore cleansing facial that targets hyper-pigmentation and brown spots with brightening ingredients. A natural hydroquinne alternative. your skins mantle , steamed towels and a scalp massage melt away stress to feel anew again! This is truly 21st century technology! A soothing red light reaches beneath the skin, this combination facial/light therapy can help aging or sun damaged skin by stimulating collagen production and inner skin firmness. A natural glow again. Enjoy a relaxing neck and shoulder , hand and arm massage to complete your experience. Soothe and calm acne while helping skin to heal and repair. Includes helpful instructions on skincare. Collagen boosting serum with a natural retinol alternative. Containing chicory root and tara tree to replenish skin and smooth crow’s feet. A thorough exfoliation and or peel to clarify, hydrate and refine your pores. Potent C and E serum reduce free radicals . Great for those with time limitations . This is the perfect facial for delicate skin or skin that is easily irritated by the environment, causing dilated capillaries and redness in the face. Our trained aestheticians will be happy to make recommendations on the appropriate skincare products best suited for the skin condition. Cleanse, exfoliate, and a balancing mask tailored for your skin . Complete skin analysis with massage to the face, neck and shoulders with ozonated steam and hot towels. The use of a natural skin peel that creates a noticeable, smoother, softer, more youthful skin surface. Deep hydration with exclusive skin care moisturizers for a radiant, healthy skin. Prepare to be pampered. 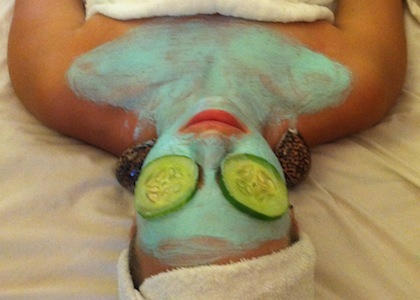 A facial for the hard-to-reach back, a gently cleansing and exfoliation with hot steamy towels. Designed to eliminate impurities while nourishing your skin. Soothe your soles with this one of a kind foot soak and custom sea salt scrub. Exfoliate away dead skin and soften your soles , complete with hot towels and hydrating Hungarian treatment lotion.